Dhaka, 12 October, Abnews: The Executive Committee of the National Economic Council (ECNEC) today approved 17 development projects with an outlay of Taka 14,200 crore. 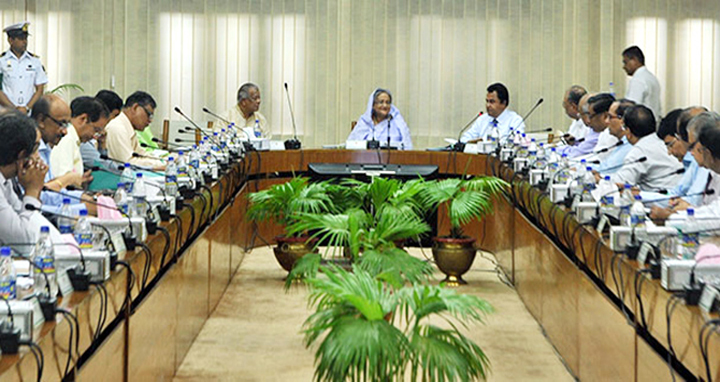 The approval came at a meeting of ECNEC held at NEC conference room in capital’s Sher-e-Banglanagar with ECNEC Chairperson and Prime Minister Sheikh Hasina in the chair. Planning Minister A H M Mustafa Kamal, briefing newsmen on the outcome of the meeting, said the ECNEC approved 17 development projects although a total of 19 projects were placed before it. “The government would provide Taka 11,193 crore from the national exchequer while organizations concerned would contribute Taka 2,811 crore and Taka 195.62 crore would come as foreign assistance for the projects,” he said. Of the 17 projects, 14 projects are new and the remaining three are revised ones, added the planning minister. The ECENC, however, rejected the Banani-Gulshan-Baridhara Lake Development project for the involvement of relocation of some 12,000 people from the project area, he said. The Prime Minister has directed the authority concerned to take necessary measures to relocate those people first before approval of the project, he added. Besides, the ECNEC meeting sent back another project titled “Mollarhat 100-Megawatt Solar PV Power Plant” to recast it. Among the approved projects, the big ones are Rajshahi WASA Surface Water Treatment Plant Project with Taka 4,062 crore; Development of Electricity Supply System, Chattogram Zone (2nd Phase) with Taka 2,551 crore; and Land Acquisition for Upgrading Faridpur-Bhanga-Baishal-Patuakhali-Kuakata National Highway into Four-lane with Taka 1,867 crore. Among the other approved projects are Improvement of Road Network at Wards and Construction of Bus/Truck Terminals in Chattogram City Corporation with Taka 1,229 crore; Construction of Houses for Cleaning Workers of Dhaka City Corporation (1st revised) with Taka 254 crore; Upgrading and Widening Bairagipul (Barishal)-Tumchar-Bauphal (Patuakhali) District Highway with Taka 302 crore; Upgrading and Widening Nandigram (Omarpur)-Talora-Dupchachira-Zianagar-Akkelpur (Gopinathpur) District Highway and Nandigram (Kathom)-Kaliganj-Raninagar District Highway For Expanding Trade and Business with Taka 179 crore; Construction of Multi-storey Office Building on the Premises of the Foreign Ministry with Taka 63.56 crore; Rural Infrastructures Development in Jashore Region with Taka 952.25 crore; Rural Infrastructures Development of Khulna with Taka 937 crore; and Bagerhat and Satkhira Districts; Extension, Repair and Modernisation of Bangabandhu Poverty Alleviation Training Complex at Kotalipara in Gopalganj (3rd revised) with Taka 344 crore.